On Tuesday, I was invited to get my hair done at the Drybar located in Buckhead. If you don't know what Drybar is, it is a salon that specializes specifically in blowouts- no cutting, color... just blow outs. I was VERY nervous about getting my hair done because 1) I have natural hair... 2) I had never been to the salon before... 3) Not everyone KNOWS how to properly straighten natural hair for it to revert back properly to it's natural state and 4) Did I mention I have natural hair?!!! Needless to say, my anxiety definitely kicked in when I walked in the door. 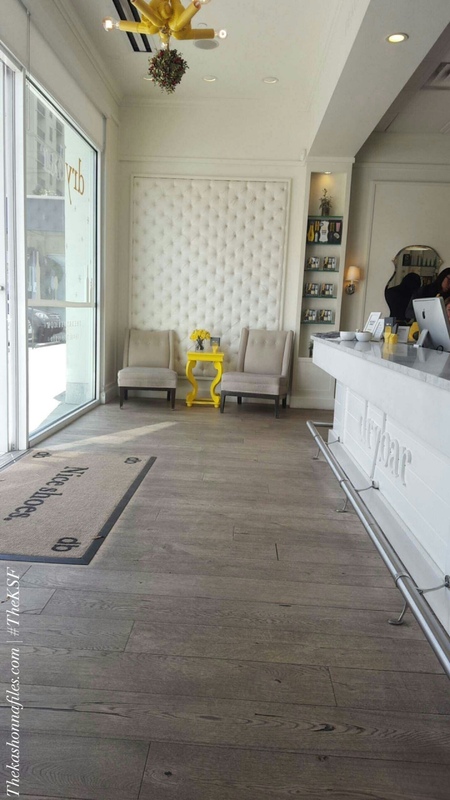 The atmosphere of the salon is very light, airy, cute and contemporary, giving you that Southern L.A. feel (hence the 1st Drybar was founded there), with the humming sounds of blow dryers galore!! The stylists were busy at work performing fabulous miracles on these ladies hair- they walk in looking 1 way and walk out looking like a million bucks... seriously! No Lie!! What "sorta" eased my natural hair anxiety was that the women walking in to get their hair done did not look THE SAME. I saw black women, white women and Asian women being services by stylist who were also of different races plus I saw some textured haired ladies.. yes, Yes and YES!! BUT... let's not get ahead of ourselves, I was being haunted by a bad heat damaging hair experience. My stylist was Rain and she came over and greeted me with a smile and complimented me on my natural hair. We had a quick style consultation and then she took me back to the wash station where she cleansed and conditioned my hair. My only note about the wash process is she only washed my hair once and did not leave the conditioner in long enough for my curly coils to process it. What I absolutely loved about the wash was they use super soft microfiber towels to dry the hair so they don't pull or snag at the hair... Yes!! After the wash process, I asked Rain again if she knew how to straighten natural hair and with a smile she said "yes". She began the blow drying process by using the Drybar Velvet Hammer "Hydrating Control Creme" and the Hot Toddy "Heat Protector Frizz Fighter". She took small sections of my hair and began to blow drying my hair with the Drybar Buttercup Blowdryer. What I love about this hair dryer is that it is bioionic and unlike that 1 time I went to the Dominicans and almost had my brain fried (no shade), I did not feel any heat and it had me wondering if it was even doing the job. Rain blew my hair out with ease doing each section of hair inch by inch not to damage my curls and with each section, I felt more at ease. After the blow dry she used the Drybar "Treatment Oil" flat iron to straighten my hair and then followed up with the curling iron to give me the Cosmo-Tai hair style. To finish up, she used the Drybar "Flexible Hold Hairspray". Needless to say, I loved my style and the way that Rain used care to straighten my hair. What I will say to all my natural curly/coily ladies who are thinking about trying this place out... Do it because it all depends on the stylist and their experience and comfort level with doing this type of texture.. not the salon. My one recommendation is that since there are lots of natural ladies (black and white) that come into the salon, they should think about adding a hair steamer for deep conditioner, because it makes sure that our curls have extra moisture for heat styling and it is just an added bonus for relaxed and straight ladies. I will definitely come back to the salon for my Rain experience! Check out their website HERE to learn more about their services.